Welcome to this month's VQW! I hope you are able to quilt with me this weekend. I have an ambitious weekend planned (I don't want to have to mulch the landscaping!). 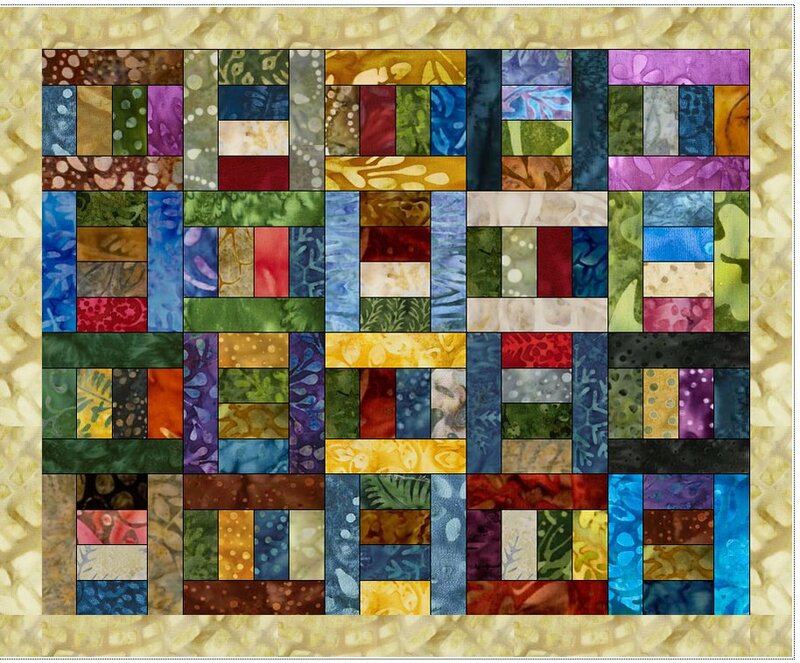 I have two blocks for my Deb Tucker block of the month to do, cut strips for a Deb Tucker class next Thursday (Morning Glory), and I would like to quilt a couple small quilts. One of the local shops is having a sale; if I buy 5 yards or more of fabric, I get 25% off. I'm trying to be good and ignore that information though. We'll see how well that works out! What are you working on this weekend? Are you starting Christmas presents, or finishing last year's? Cleaning and organizing your room and stash? Shopping to add to your stash? Maybe making something for yourself, or a charity? Whatever you're working on, please share with us. Next VQW is June 29-July 1. Hi Heather! No sewing for me this weekend, we have a 4 day garage sale planned. And enough baby and toddler clothes for a small village LOL - I should know, as I have priced it all! I will check in every day though to see all the wonderful projects that are happening. I’ve got piecing for a large bed quilt to work on and two small pouches cut and ready to put together. If I can also get my fabric ready for boom21...I will call it a successful weekend. Good evening Heather, I plan to work on making most of my swap blocks this weekend. I have 10 blocks I will cut/sew. That will finish that swap. I will start on my 100 6” 9-patch blocks for another swap. Then I will cut out and maybe start sewing for my last swap group. I’m so excited you started this tonight. I could get more cut if my cat got off my cutting mats. In between that I will work on a small UFO, and quilt a small baby quilt. I’ll check in off and on throughout the weekend. I'll be joining everyone this weekend! I'm working on some Sister's Choice blocks using the swapped 9-patches in the centers. I’ve got 8 placemats ready for quilting tomorrow. On Saturday a quilting friend is coming over to play who knows what we’ll get up to. And I’ve got several art quilts that need quilting and embellishment so those will get some atention on Sunday. looking forward to seeing what everyone”s working on. Already started, we are at the cabin. Cut strips for a table runner today, want to get that done tomorrow. Then work on a chemo quilt, and bind my table topper. All while enjoying the great outdoors. I'll be alternating between getting the garden planted and quilting. It's going to get hot the next few days so I'll be outside in the morning and evenings and in with the LA and AC during the hot. I have a lot of tops that I need to get working on. I'm In! I saw a picture online and drew it up in my EQ5. (Here it is.) I have all of the blocks done, and several are sewn together. I am also making progress on hand quilting my Converging Streets. I'll be making the ringbearer's pillow for my daughter's wedding. I am in. My priority will be working on the last Mystery Train ride quilt. I hope to get the top finished this weekend. Then I will work on finishing 2 charity quilt tops. I was at my LQS tonight for a BOM and the new ruler for tonight was Corner Beam from Deb Tucker. I am excited to have this ruler so will probably play around with some fabric and make some scrappy blocks along with making my block for next month's class. Boston, that looks like it will be really pretty! Poor planning on my part - I made plans with my sisters before I realized it was a holiday weekend, so no sewing on Saturday will happen. But the time I have on Sunday and Monday will be spent working on getting Talkin' Turkey, by Bonnie Hunter, together. Blocks are done, one border done. Now to get them all together into a top. Also some shirts to deconstruct, and if there is any time after that, I need to practice some hand quiilting. Must.Finish.Quilting.En.Provence...and Dance of the Dragonflies (about half done). I would love to join you! I finished quilting two quilts today that I need to bind. Who knows what i’ll get into after that, but there are plenty of WIPs to choose from! Looking forward to seeing lots of pictures! Count me in! I need to border a crib quilt. I cut out the pieces for a carpenter square tonight. Depending on how things go, I will either work on it or my bargello. I'm in. I have 10 baby quilts that need bindings to be hand stitched. They should be delivered to a crisis pregnancy center next week along with other stuff. ... And, in my spare time, I have a ton of scraps left to tame (cut into squares). Here's hoping for all of us to have a happy and successful weekend along with prayers given for our military folks. Count me in. It turns out that I'm not much good at improv, because I've had this quilt on my design wall for several weeks and continue to move parts around as well as making checkerboards, diamonds, different types of trees, mountains and little houses to add to it. It all started with the longhorn cattle fabric which I love. I plan to really buckle down this weekend and finish the top at last. I’ll join in. I’ve completed the Boxes of Strings top plus the Mystery #19. Now to back both. I have fabric for the Mystery but not for Boxes. I don’t want to shop on this holiday weekend, though. I also need to quilt my Final Frontier. I have it sandwiched so it’s ready. I misplaced an essential pressure foot & darning plate so I had to find those in order to do the quilting. They’ve been found, so no more excuses. I’m also sewing a purse from leather & that’s had my attention lately. I’m working on two table runners this weekend. I’m making one for the April to June swap and decided to try to double the blocks as I work so I can have a twin to keep for myself. Artsyone- I like that a lot. 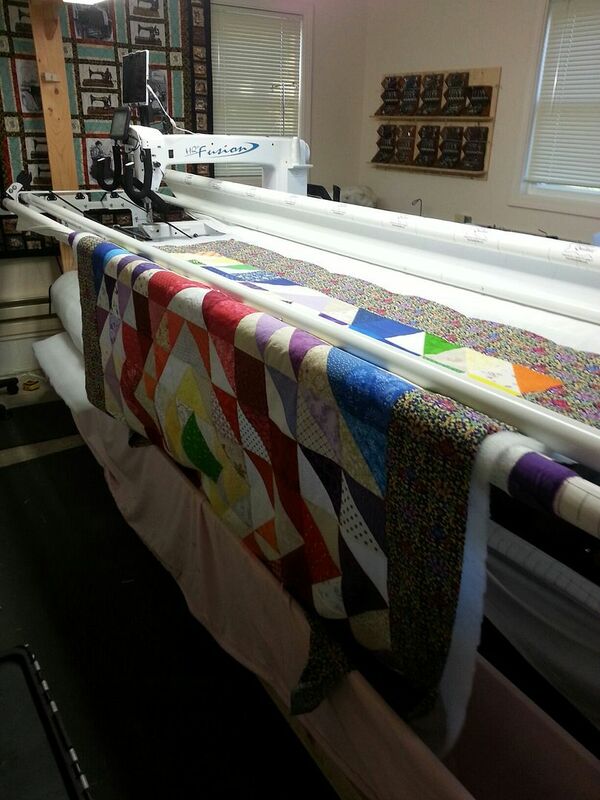 Youkve got most of your big elements chosen and once you’ve decided for sure where you want them to land on the quilt all you will need are the filler strips to make it all fit. Have you been taking photos each time you rearrange it? That's always helpful for me. Also when you take pics of an arrangement be sure to use the edit feature to put them in monochrome so you can clearly see any place that might need lighter or darker values- that’s another trick that has helped me when I’m being stuck. Krisb, would love to see your Dance of the Dragonflies. I bought the pattern and fabric, and it's at the top of my "next in line" list. I traced out the pattern for the templates. I'm planning on doing mine sort of reverse applique in that I want the black wing lacing to be on top. I wanted to do turned edge, but think I'll go with raw edge because I think the turned edge is going to be above my level at this time. Or at least with a project that is extensive with inside corners. I have my first quilt loaded on the frame. Have to put in four hours of office work, then I'm off until next Tuesday! I counted up, and currently have 19 tops ready to quilt, but about 1/3 are small, and I don't think I have any King size in this bunch. Though I know I've got a couple of large queens. I do have two kings waiting for binding . . .
Last edited by Macybaby; 05-25-2018 at 04:53 AM. I'm glad to say I just finished quilting 2 over sized lap quilts using the Arcadia PP pattern. I recently acquired the IQ for my Innova machine so I had to learn how to use it first. The youtube videos were a great help to me beforehand so I had an idea how to use it but once I started using it all that I had viewed had flown out of my head so had to go back to the videos from time to time. Of course trying the IQ with this pattern was not a great idea but I needed to get it done by this weekend. I'm binding the last one right now. Think I might take the weekend off......................nawwwwwwwwww. I'll get started on the next quilt to be quilted for a friend down in Florida. I'm loving the IQ (IntelliQuilter robotics). Have about 8 quilts waiting to be quilted so I've got my agenda marked out for me. Now back to hand binding. I am in! This board is going to keep me quilting til I draw my last breath! 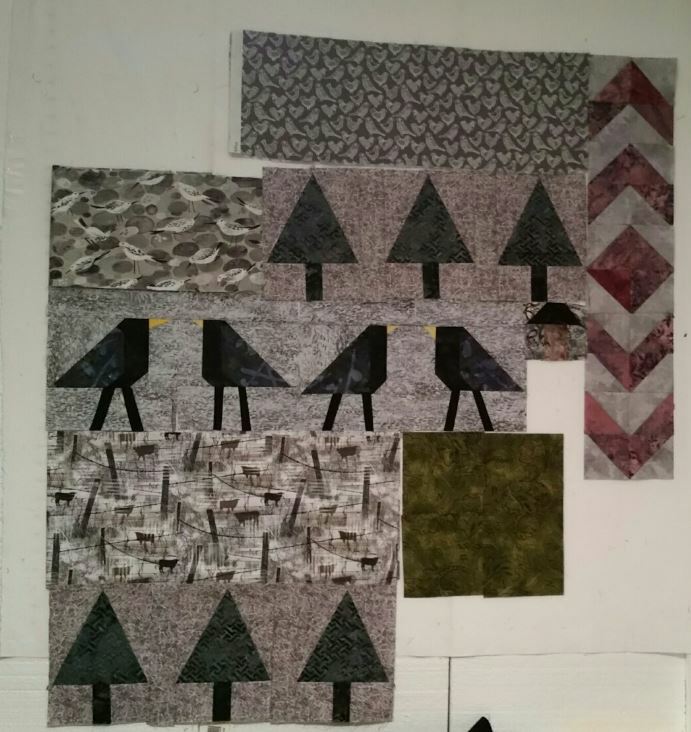 I am working on a 'wonky house' wall hanging - inspired by a picture of a quilt here on the board. I am also working on a jellyroll rug quilt - a project also inspired by a photo here on the board.